And on this farm he had a goat. This week, in my new world of vegetable farming, I’ve had three experiences with or about goats. “I dig a trench [in the compost pile] and fill it will hooves, stomachs, offal. Cover it up, and in one week’s time you’d never know it was there”. I have recently gotten involved with a network of local farmers that provide training and mentorship to apprentices and interns like me. While grateful for the opportunity to learn, for free, from folks who are donating their time and energy to train the next generation of vegetable farmers, it comes at the price of heartbreak in this cult of omnivores. In what would seem like an innocent “Intro to Compost” class, the instructing farmer spoke offhandedly about his mass grave of animals as if he was recycling old newspapers. This grave of stomachs sunk my own belly down into a pit of sadness. Why kill innocent, sentient beings when plant-based composting is just as effective, and a whole lot less cruel? Read about how to create your cruelty-free compost heap on the Vegan Organic Network. 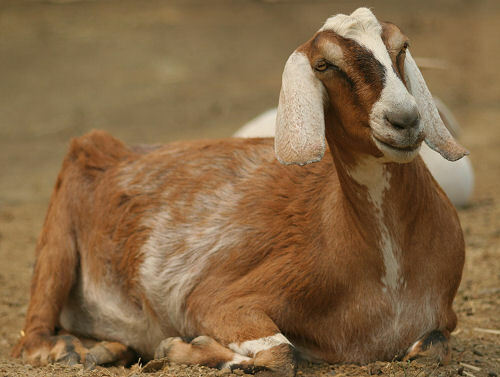 Carmen is not a goat, but she, too, was kept as a weed eater. I’ve also been interning 1-2 days per week at the aptly named Sweet Roots Farm, where two sweet young farmers named Deena and Robbie are in their second year of organic vegetable farming. It’s not a veganic farm, i.e. there is animal manure in their compost, and while those conditions are not ideal for me, they are tolerable for me in this work-learn relationship. This week, as we propagated veggie and flower seeds in the greenhouse, we chatted about weed control. I’ve been conflicted with our use of plastic weed barrier at Animal Place, and looking for other manageable ways to suppress these crop killers on a larger scale. For vegetable beds, we spoke of the importance of soil cultivation and timely tilling, cover crops, and other carefully planned techniques that could minimize the manual labor (or use of plastic) over time. According to the Puget Sound Goat Rescue, goats not only like these weeds, but need them in their diet to be healthy. Animal Care Manager Jamie London at Animal Place backed this up with, “Goats LOVE blackberries, they’ll take them right out of your hand!” It’s a relief to me to think that my new teachers at Sweet Roots could cultivate a caring, symbiotic relationship with their companion animals. Over at Animal Place, I’ve fallen in love with Carmen, a tri-pod lamb who was rescued from neglect in a pasture where she, like so many goats, was kept merely to mow down unwanted vegetation. 8pm, Wednesday, March 14, 2012. I was putting the finishing touches on our late meal of baked potatoes and lentils when my boyfriend Greg radioed me to put on all my rain gear, bring the headlamps, and meet him at the Animal Care Room to help with an emergency. One of the old-timer goats, Gilbert, had been acting strangely; he would not follow his herd into the barn at bedtime, and was standing obstinately in the pasture, drenched and grinding his teeth in distress. It took three of us to urge Gilbert into his bed of straw in the trailer, pushing and pulling and coaxing. With empty bellies and pounding hearts, Greg and I jumped into the truck’s cab and zoomed off to the vet hospital at UC Davis for emergency care. Temporarily blinded by what turned out to be a urinary blockage that is common in castrated male goats, Gilbert lay shaking on a cold metal examination table while a fourth year student shaved his abdomen for an ultrasound. A people-shy goat by nature, I imagine that the touch of multiple human hands on his body, in addition to the loss of eyesight and physical pain he must have been feeling, was hugely traumatic for Gilbert. The tickle of the ultrasound device sent him thrashing into Greg’s arms on the floor. We stayed for a little while longer – not really much help to the skilled vets, but unable to tear ourselves away from this critter, so clearly experiencing physical pain and strong emotions. We’re not sure that Gilbert will survive, but at least he was able to live a peaceful life at Animal Place. Read more about Gilbert’s life as a peacemaking and curious goat on Animal Place’s website.